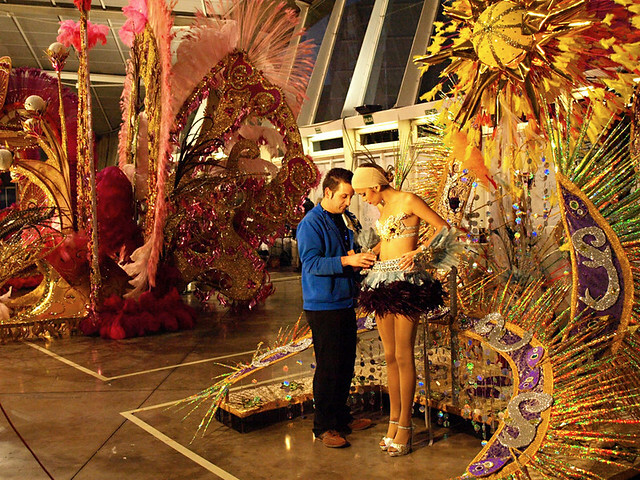 Continuing our peek behind the scenes of carnival on Tenerife. 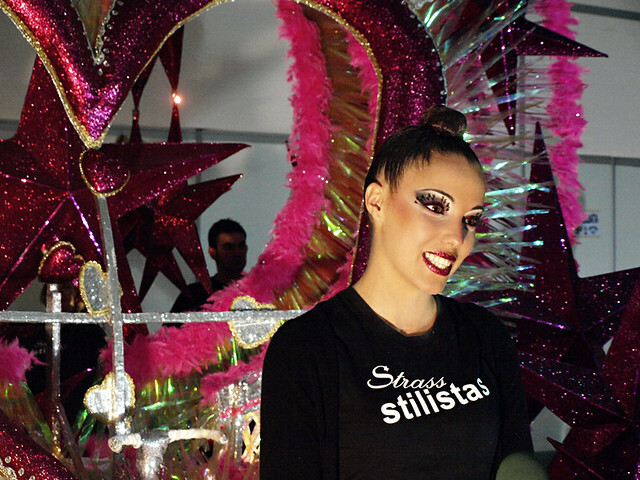 After the costumes are designed comes the big night, the grand gala for the election of the carnival queen in Santa Cruz. Out front is all glitz and glamour, but what is it like behind the scenes? Frantic last minute preparations? Tantrums, tears and tiaras? The reality is quite surprising. In the last couple of hours before the gala starts, backstage is remarkably calm and quiet. 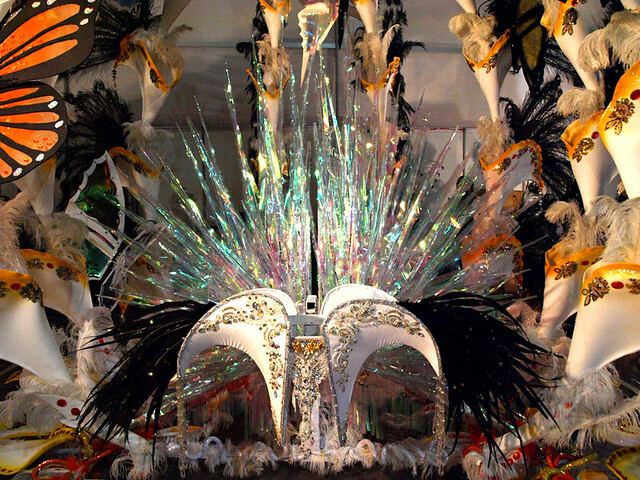 We all know how fantastical the potential carnival queens’ costumes are but without their queens they lose some of their pizazz, instead looking like surreal skeletons lacking flesh and a soul. 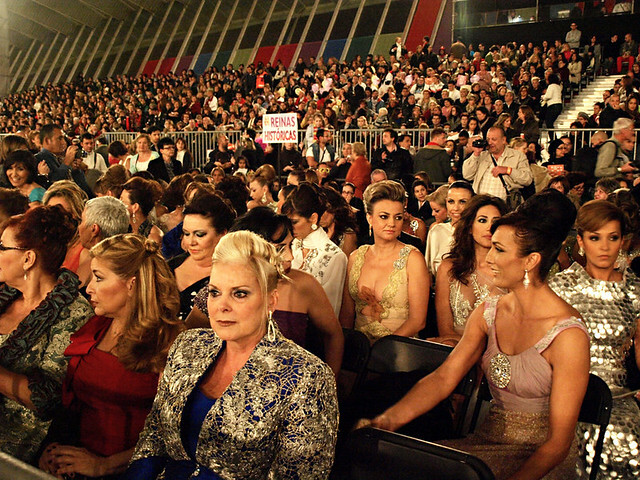 The huge backstage area of the Recinto Ferial can be more akin to a carnival museum than what you’d imagine backstage at a beauty contest would be like. Some of the strangest sights are the carnival queen candidates themselves before they get fully ‘costumed up’. There’s a Black Swan ballerina look to this candidate, her plain black tee shirt looking incongruous with her beauty queen make up. In the last hour or so before the gala starts, the queens spend their time posing for photos and giving interviews to local TV, radio and press. I particularly liked this sparkly bra and parka combination. Perfect if the carnival night turns a bit chilly. Without the final pieces and carnival queen ‘driver’ in position, it can be a bit of a puzzle to figure out what some of the costumes are meant to be. 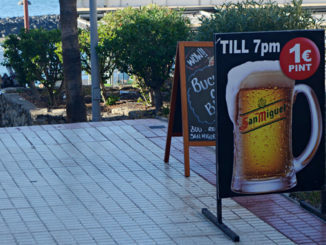 Hearing English being spoken is a rarity at events like this on Tenerife, so it came as a surprise in 2012 when one of the queens shouted after us ‘Oy, why aren’t you interviewing me?’ in a broad Manchester accent. She was as Canarian as everyone else but had a Mancunian mother and an exuberant personality. Even though they’re in various states of undress and are being prodded and tweaked by their designers, the girls remain good natured throughout. They smile for anyone who points a camera in their direction, even though their headgear, without the final head piece, isn’t what you’d call glamorous. There are no prima donas here. As the time for the start of the gala draws closer, the mood changes slightly and smiles are replaced by more serious expressions. It is the biggest event of the year and fame of sorts awaits the winner. As the press are ushered out of the backstage area, final adjustments are made to costumes. The arena fills up with a sell out, mainly Canarian audience. This is overwhelmingly a local show. 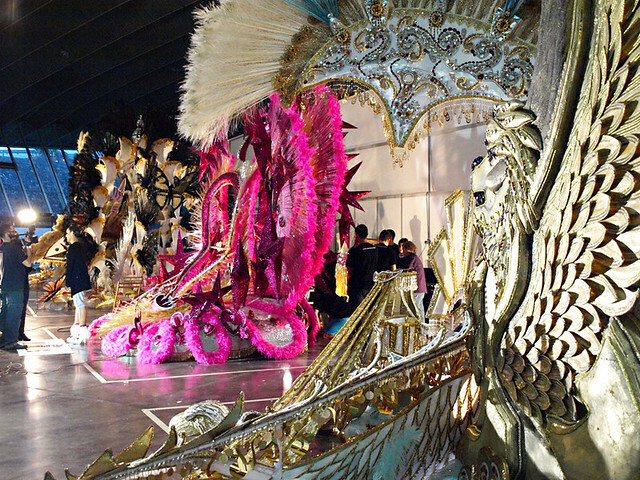 Pride of place goes to Santa Cruz’ former carnival queens. Once a carnival queen, always a carnival queen. 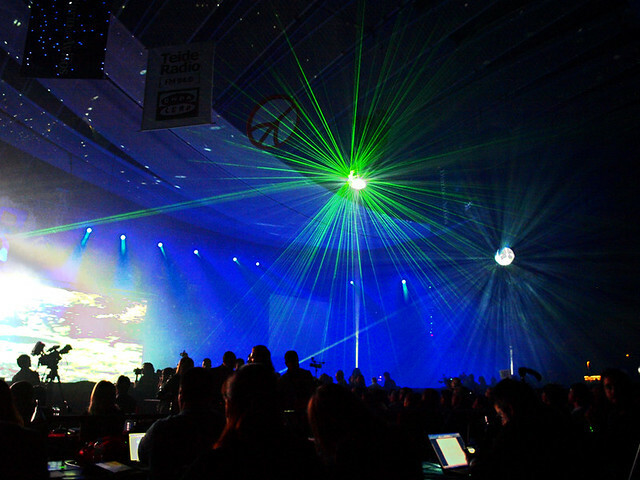 The lights dim, lasers dance around the arena and the election process begins. 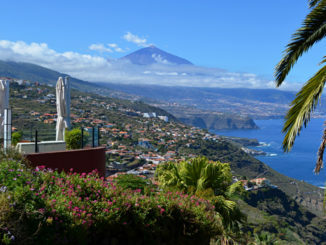 Four hours and a lot of singing, dancing and parading later there will be a new carnival queen – the signal that carnival on Tenerife can begin in earnest. 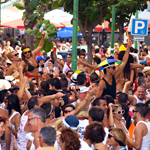 Next in Behind the Scenes of Carnival on Tenerife – The morning after the night before for the new queen. 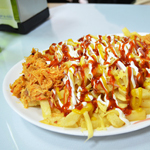 Have You Tried Papas Locas on Tenerife?